Cats can't imagine something that's never happened to them before. Instead, they remember past experiences and believe the same thing will happen again. Because a puppy or kitten's first car trips aren't always that pleasant, some pets dread traveling. Instead, help cats associate cars with fun, happy experiences instead of just trips to the vet. The process, called desensitization using classical conditioning, takes patience and time but works whether your kitty acts scared, sick, or hyper. Use positive reinforcement, and once he realizes a car ride means wonderful things for him, he'll look forward to every trip. For safety's sake, kittens and cats must ride inside a carrier while in the car. A loose pet becomes a furry projectile in case of an accident. The driver needs to concentrate on the road and traffic, not the baby on your lap or under the pedals. Even well-behaved cats loose in the car could be injured, because an airbag will crush the crate and pet if on the front seat during an accident. So be sure to crate train the cat before you hit the road for a vacation. Even though he'll be inside a crate, it's helpful for kitty to experience positive things about the car before you start the engine. Cats are sensitive to the environment and territory which is why they prefer staying home in familiar surroundings. So make the car familiar by allowing Kitty to cheek rub and spread his scent to claim the car as personal territory, and he'll feel more relaxed and happy during travels. 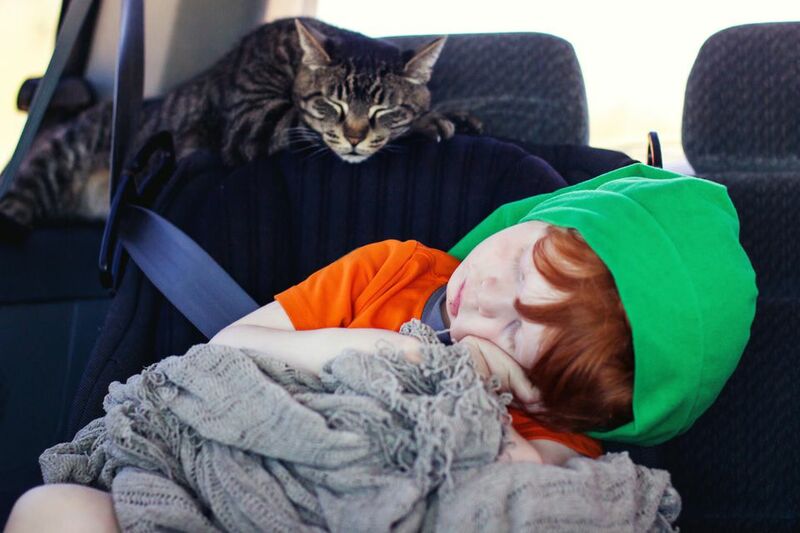 Place the cat's bed, blanket, or a towel you've petted him from inside the car on the back seat. That way, his scent is already inside. Spraying Comfort Zone with Feliway on the towel or car upholstery also may help the cat feel more relaxed. Get inside the car with your cat, close the door, and let him sniff and explore a bit. Take care that small kittens don't squirm into cubbyholes under the dashboard. Five minutes is long enough. Be ready to get the kitty back into safe, non-scary surroundings should he act overwhelmed. You might see fluffed fur, down-turned ears, active tail or vocalizations. Repeat this five-minute car visit a couple of times a day for several days, extending the time whenever the kitty stays calm. Make mealtime car time. Once he's calm in the car, feed all his meals in the car for a week, or offer very high-value treats that kitty gets at no other time. If your cat is more motivated by play or catnip, indulge him with favorites during the car times. He should learn that only these good things in life happen when you're near the car. You should be combining the crate training with car visits. Once kitty accepts the car as his territory, place him in his carrier, set it on the back seat (away from airbag danger), and start the car. Then turn off the motor and get out without going anywhere. Do this three or four times during the day until the pet takes it as a matter of course. Each time, you'll give him lots of play or other rewards once he's released from the crate. Finally, after you start the car, back the car to the end of the driveway and stop. Do this two or three times in a row, always letting the pet out after you return. If the pet cries or shows stress, you may be moving too fast for him. The process takes forever, but it works. Continue increasing the car-time by increments—a trip around the block and then home, then a trip down the street and back, and so on. Make every car trip upbeat and positive, so the experience makes the cat look forward to the next trip.